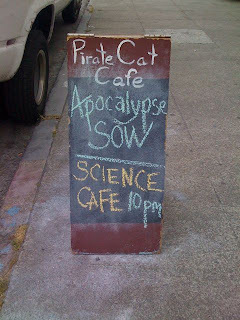 Our Swine Flu and Mass Hysteria discussion with Dr Kirsten Sanford and Brian Malow marked the first science cafe event at Pirate Cat Radio Cafe, which went down smooth with plenty of maple bacon lattes for everyone. 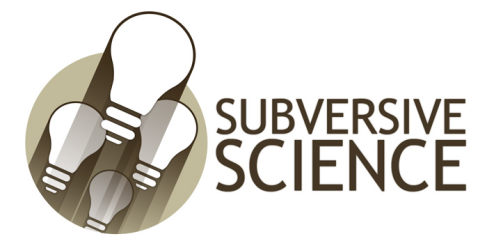 As promised, here's the PODCAST of this event. It starts off with some music as we are setting up, and then our usual news and public service announcements (even we pirates hafta follow a code! ), but we get right into the discussion after that. This was also our first use of Ustream as a live video feed of the cafe. There were audio issues in the first 15 minutes but we got 'em worked out during a music and drinks break... which I hear from certain vocal critics were TOO LONG. But wanting more talk and less rock is a problem you want to have on a talk show, right? The listener feedback so far has been amazing. Please go to Dr Kiki's website and Brian Malow's website and let them know how much edutainumental fun they were to have in conversation at the Pirate Cat Radio Cafe. The next one's sure to be even better! I haven't seen any promotion of the Water Crisis event. Is it still planned for June 23 (today)? What time? The next one will be on July 31st, and we're not doing Water Crisis. Skipping right to Capitalism as Virus. The Friday Apocalypse Series begins!